Today’s comic stars Paul an awesomely patient and just plain awesome reader! Guac is always extra. Sounds like someone never wants his freedom back. 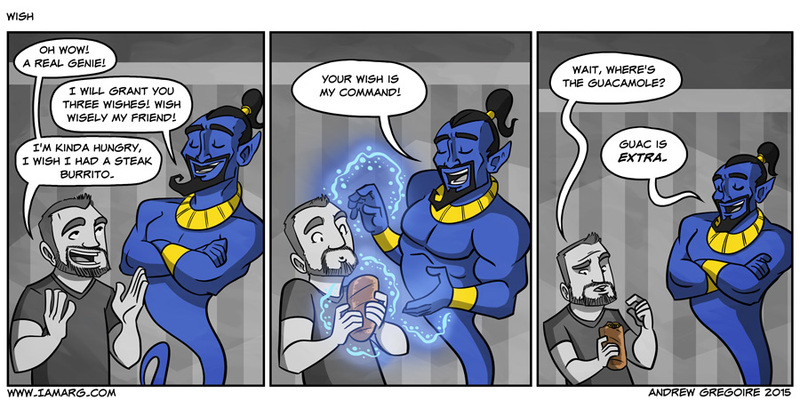 Are Genies EVER the good guy? They SAY the lesson is “Be careful what you wish for”. But I say it’s “BE SPECIFIC”. When you wish for Guac, make sure it’s real Guac and not that gross Avocado paste. Because guacamole is terrible against the multi-vegetable glory that is salsa.